A big congratulations to the winner of the Mothering subscription giveaway — #90! "This interested me: http://mothering.com/education/does-adhd-even-exist." I have never had a subscription before. This was a joint giveaway with Natural Parents Network, so entries were combined and one winner drawn. Kim entered at Hobo Mama Reviews. Mothering magazine is the perfect parenting magazine for those interested in attachment values and natural living. If you were not the lucky winner, it's easy to subscribe to Mothering online at Mothering.com. You can also find print issues for sale on newsstands at select brick-and-mortar locations, notably natural foods stores such as Whole Foods, major bookstore chains like Borders and Barnes & Noble, and Babies R Us. Mothering also has published inspirational and informative books, such as Having a Baby, Naturally: The Mothering Magazine Guide to Pregnancy and Childbirth and Natural Family Living: The Mothering Magazine Guide to Parenting . Print subscriptions start at $22.95 (U.S.) for one year (six issues) to the United States. Canadian and other international subscribers add $13 per year. Print subscriptions typically enter you into giveaways and can often include free gifts as well. If you sign up for the newsletter, you'll receive advance notice of any deals connected with subscribing. Digital subscriptions start at $4.95 for one year and are available internationally. Both forms can be given as a gift subscription with e-card, perfect for a last-minute holiday present. Connect with like-minded parents on the Mothering.com forums. Sign up for the Mothering.com newsletters. Subscribe to the Mothering.com RSS feed. Like Mothering Magazine on Facebook. in exchange for hosting this giveaway. HAVE KIDS, WILL TRAVEL special event: I am featuring a few special travel items for review that I was able to use on my trip with my three-year-old son and eight-year-old niece this summer and another trip with my family in the fall. Enjoy these fabulous family travel products! One of the worst parts of traveling with kids by plane is lugging the car seat through the airport. Am I right? When I saw the CARES Child Aviation Restraint System from Kids Fly Safe, I just knew I had to give it a try. 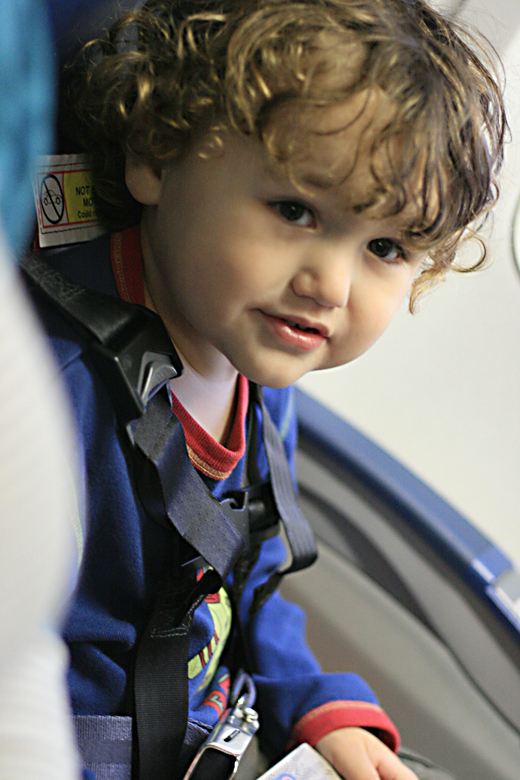 The company graciously agreed to give me a harness for review, so I was able to use it with three-year-old Mikko on our flights, both to the East Coast and Midwest, this summer and fall. Why is CARES better than a car seat for airplane travel? CARES is a special harness that's been tested and approved the FAA as being safety-equivalent to using a car seat in an airplane for children age 1 and older who weigh between 22 and 44 pounds and are no more than 40 inches tall. CARES has also been certified in the UK, Australia, New Zealand, Canada, Switzerland, and Oman. See the FAQ for specific airlines that have authorized the use of CARES. 50% off at Amy Adele for thank-you cards and other stationery! Starting today, December 20, there will be a Thank You Card Preview sale at Amy Adele! Get 50% off any order with a purchase of $25 or more sitewide! You know you'll have plenty to be grateful for this season, so get your thank-you notes ordered now! The designs work for kids and the whole family. And even for holiday births! Get 40% off select items at AmyAdele.com. Hurry — ends Christmas day, Dec. 25. Use your holiday gift money to buy yourself some Christmas treats with that sale! 75% off $75 order at BabyLegs! Order $75 worth of Clearance Items at BabyLegs and get 75% off! Shop now for the best selection. Use coupon code WINTER75 at checkout. You would pay just $18.75 for $75 of BabyLegs leg warmers, arm warmers, baby socks, and girls' tights! Shipping is free on all orders. Coupon rules: Clearance items only. This coupon only works if you have $75 worth of items from the clearance page in your cart when you enter the coupon code at checkout. This offer cannot be combined with other offers or coupons. While supplies last. Disclosure: Babylegs links are affiliate links. $10 2-day Express Shipping on orders $100 or more (normally $16) at Destination Maternity! Use code: FROSTY, valid 12.18 to 12.21. $10 2-day Express Shipping on orders $150 or more (normally $16) at A Pea in the Pod! Use code: SANTA valid 12.18 to 12.21. $10 2-day Express Shipping on orders $75 or more (normally $16) at Motherhood Maternity! Use code: JINGLE valid 12.18 to 12.21. Disclosure: Destination Maternity links are affiliate links. Mikko's dancing feet in motion! Prima Princessa sent me their new DVD for review, Prima Princessa Presents: The Nutcracker . I was so excited to check out Prima Princessa's version of The Nutcracker, because my three-year-old son, Mikko, absolutely loves his original DVD from them, Prima Princessa Presents: Swan Lake . You can read my full review for that DVD here. But to recap, what I liked about the Swan Lake DVD was how it combined a narrated and abridged filming of a real ballet production with simple ballet instruction for my little guy — with plenty of time to leap around. What I was a little less enthusiastic about I had high hopes that Prima Princessa had fixed with The Nutcracker — and I was right! First of all, The Nutcracker has what I liked about Swan Lake — children get an introduction to a real ballet production and a sense of the story behind it (narrated by the animated Prima Princessa); they get to hear ballet terms and see them demonstrated by talented students from the School of American Ballet; and they get time to dance around, freestyle. Little boys are included in the children's scenes. All the kids are having a sort of Christmas gathering, and the little boys get to dance around with fake swords. The student demonstrators from the American School of Ballet and, of course, the professional dancers also include males among their ranks. The professional ballet company, the Birmingham Royal Ballet, has a more ethnically varied cast, which we could also see with the little kids and the students from the American School of Ballet. The reason I was so intent on showing Mikko boys doing ballet is, of course, because he's a boy! I love that he can see that dancing isn't only for girls (despite the pink and purple of the DVD cover), that it's something he can choose if he'd like as well. I take an adult ballet class, so he's interested right now in anything his parents do, so I love that I can share the magic and joy of ballet with him in this kid-friendly fashion! Here are some fun pictures of my little dancing guy while watching Prima Princessa Presents: The Nutcracker . This is Mikko's version of a passé. I have to say I was really impressed that he was working so hard to duplicate what he saw on screen! Here's his develope to the side! The Santa hat was a necessary addition! The running time for the DVD is 60 minutes (up from 40 for Swan Lake). Bonus features on the Nutcracker DVD include easy holiday crafts to do with your kids, such as a paper chain and cut-out snowflakes, and extra dance party music. Mikko loved watching all the elements and boogying to it all! Thank you, Prima Princessa, for another wonderful ballet DVD for little ones! The Prima Princessa DVDs are priced at only $6.99! This fabulous price was set intentionally so parents of most any income level can afford to give their kids the gift of a ballet experience. If buying one isn't in your price range, though, or you want to preview before buying, check to see if your library has it. 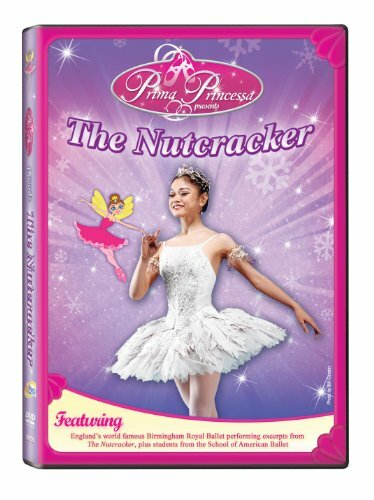 You can buy Prima Princessa Presents: The Nutcracker and Prima Princessa Presents: Swan Lake at Amazon for only $6.99 each, where they're eligible for free Super Saver Shipping on orders over $25. The Nutcracker in particular would be a well-loved gift for any little enthusiast for tutus and tiaras. Just be aware of Amazon's shipping dates for holiday delivery: For the United States, the deadline for Super Saver Shipping is Friday, December 17, to receive your order by Christmas. Monday, Dec. 20, is the cutoff for Standard Shipping. Other options can be found here. Here's a link for information on international shipping . Prima Princessa has also come out with a book for beginning dancers: Prima Princessa's Ballet for Beginners: Featuring the School of American Ballet , on sale right now for $10.97 on Amazon. Subscribe to the Prima Princessa TutuZone blog. Have a look around PrimaPrincessa.com, where you can find fun & games, coloring pages, ballet definitions, directories for ballet schools and tutu shopping, and a teacher's guide! Disclosure: Prima Princessa sent me a free DVD for review. That's how I roll. See my full disclosure policy here. I was privileged to receive sample holiday cards from Tiny Prints to review. They're as gorgeous as I was expecting! Tiny Prints has a collection of chic, unique designs, and the printing was top quality. These photo cards serve a dual purpose as a festive ornament for a Christmas tree, sure to keep your family's smiling faces on display throughout the holiday season! I even liked the inscriptions. They featured lovely fonts and delicate printing. Wouldn't this dual-sided fan card be perfect to showcase a large family, or simply a generous collection of favorite photos? This one I love. It has a clever flipping design that unfolds to display a new message and a photo on the reverse. Enjoy FREE shipping for all orders of $45 or more! Prices have been reduced on ALL expedited delivery options. No code required, limited time only. Shop now to save 10% off birth announcement orders of $99 or more! Last Day! Prices on holiday cards and party invitations reduced up to 10% PLUS Take an additional 15% off! Offer expires Monday, Dec. 13, 11:59 p.m. (PST). Here's some information about ordering in time for holiday delivery. Assuming you want holiday cards to arrive to your home before Christmas so that you can send them out on their way, you can order Express ($9.95) by today, Monday, Dec. 13, to receive your order by Friday, Dec. 17. Prices have been reduced on all expedited shipping options, which is so lovely for us last-minute types. If you can wait till the next week, you can order photo cards, holiday invitations, winter birth announcements, and personalized gift tags by Tuesday, Dec. 14, using the free shipping option, to receive them by Dec. 24. You could also order Priority ($4.95) by Sunday, Dec. 19, or Express ($9.95) by Monday, Dec. 20.That's actually some astonishingly generous leeway for custom printed orders! Tiny Prints also offers custom photo keepsakes that would be perfect for holiday gift giving, including photo books, photo calendars, and photo keychains. To receive photo gifts by Christmas, order with Standard shipping ($3) by today, Monday, Dec. 13, or Priority ($4.95) by Sunday, Dec. 19. For photo books and calendars, Standard shipping ($3) requires orders in by Wednesday, Dec. 15, or Priority shipping ($4.95) by Thursday, Dec. 16. See more details about holiday shipping dates at this handy chart, including delivery to APO addresses and delivery outside the United States. So many choices, so little time? Check out Laura's Picks Page to help you home in on some of the most stylish choices for your holiday greetings and gift giving! Disclosure: Tiny Prints links are affiliate links. Private sale at Tea Collection — up to 70% off! Free Christmas shipping at Amy Adele ends Sunday! 20% off at giggle for the best in baby products! 20% off Current Labels in December! 20% off plus free shipping on Robeez baby shoes!